I cook risotto every week. Sometimes the dish is hearty. Sometimes I prefer to turn it into an elegant and dressed-up meal. But always, risotto flows naturally, like a play well rehearsed. It’s also very convenient at the moment for various life events. One, I am completely absorbed by the revisions of my cookbook. Two, when I draw, play legos or read books with Lulu, I make simpler foods. And three, I am cooking in a tiny kitchen at the moment while our kitchen–in the new bigger home–is being completely remodeled. And oh! let me add how excited I am to see the final result soon. A new kitchen, imagine that! There’s still a lot of work, and a good number of weeks ahead, but when the project is done, it will be the promise of a beautiful serene place where I’ll be able to cook even more. Better. I have the hope. I cooked this risotto once when we were in Belle-Île en mer. 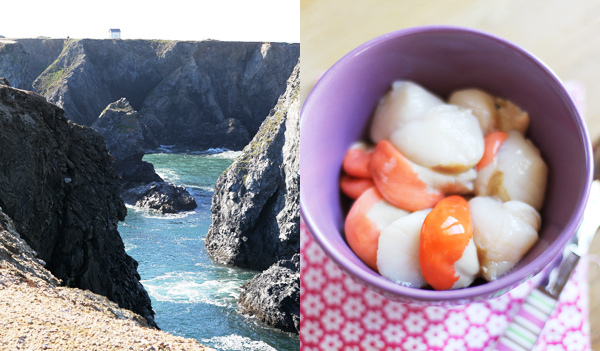 I had purchased outstanding langoustines and coquilles St Jacques (with the coral, you know, that pretty deep orange piece that is part of a scallop) that were so pretty that I wanted them to stand out on our plate inside a dish of warm pearls of goodness. Risotto allowed for that to happen. So here you are. I am sharing the recipe with you tonight. I won’t chat for too long either. I hope you don’t mind. Because as rare as it happens, I am sick with a bad cold and I need to get some more rest. You know, too, that risotto helps in situation of that nature. Right? Comfy food that soothes the aching body and takes the headache away. La recette en français suivra…merci de votre patience. In a pot, heat the stock; keep warm on the side. In a large pot, melt 1 tablespoon butter. Add 2 tablespoons olive oil. When warm, add the shallot, fennel, celery, thyme and cook for 2 minutes, stirring, until the shallot is soft but not brown. Add the rice and coat for 1 minute. Add the wine and let cook until it’s fully absorbed by the rice. Add 1 cup stock, the tomato, bay leaf and cook on medium heat, stirring occasionally. Wait until the stock is absorbed to add more. In the meantime, using a frying pan, melt 1 tablespoon butter. Saute the scampi and scallops for 1 minute on each side, until they are barely cooked; season with salt and pepper and keep warm on the side. When the rice is almost fully cooked (it should be al dente), stir in the watercress and add the rest of the stock. Stir in the cheese and chervil and parsley, add the scampi and scallops, season with salt and pepper, stir gently. Stop the heat and cover for 2 minutes. Discard the thyme and bay leaf. Serve the risotto in deep bowls and drizzle with olive oil. lovely, risotto with shallot, celery and fennel- wow i can only imagine how delicious this dish is . as i read the recipe with all those fresh herbs, my mouth watered…risotto is one of my favorite all time things, even when i’m not sick. Beautiful photos! Looks so delicious…Hope you feel better soon! Beautiful and this risotto sounds wonderful, I’ll have to try it soon! A new kitchen, ah I would love a new kitchen, here’s to lots of cooking in yours. Your risotto looks absolutely wonderful! Get lots of rest, if you can, Béa. It truly is the best medicine. looks so yummy and beautiful. Thanks for sharing! Hi, yr risitto recipe calls for 3.5 to 4 cups stock twice. Assume this is a mistake. Pls advise. Thks. Bonjour belle Béa, ton risotto est très semblable à celui que j’ai fait pour la première fois et tu me donnes drôlement le goût d’en faire pour souper ce soir. Car, comme toi, j’ai un vilain rhume depuis mon retour de France mardi, et j’ai des plans à préparer pour ma nouvelle cuisine et mon nouvel appartement. Prends soin de toi! as always, pics and recipe looking wonderful and delish! This is my first time visiting your blog and I’m blown away. Your recipes are solid and the accompanying photos… Wow! This looks absolutely amazing. Risotto is my favourite and I also seem to make it every week! 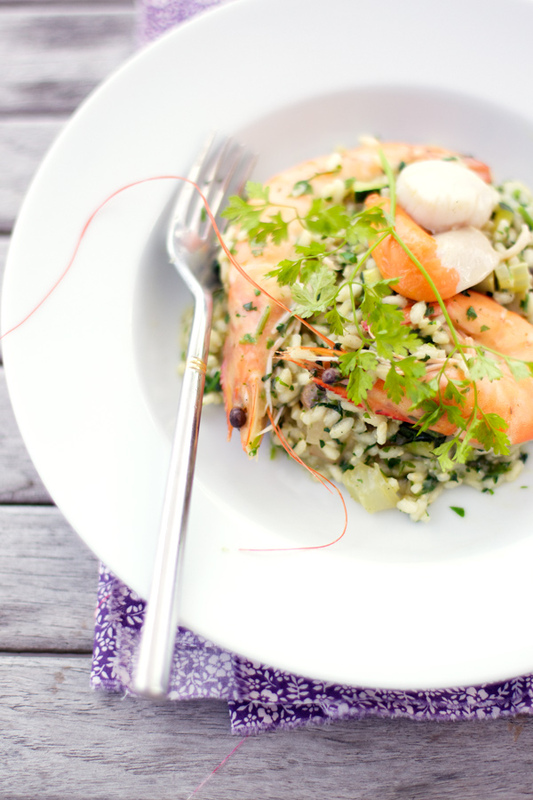 I also love seafood so this is the perfect dish for me – will definitely be trying this. Get well soon – at least you have great comfort food to get you through it! Hope you feel better soon Bea. Nice to have a new kitchen to look forward to. Beautiful photos! I love making risotto as well. Hope you’re over your cold soon! 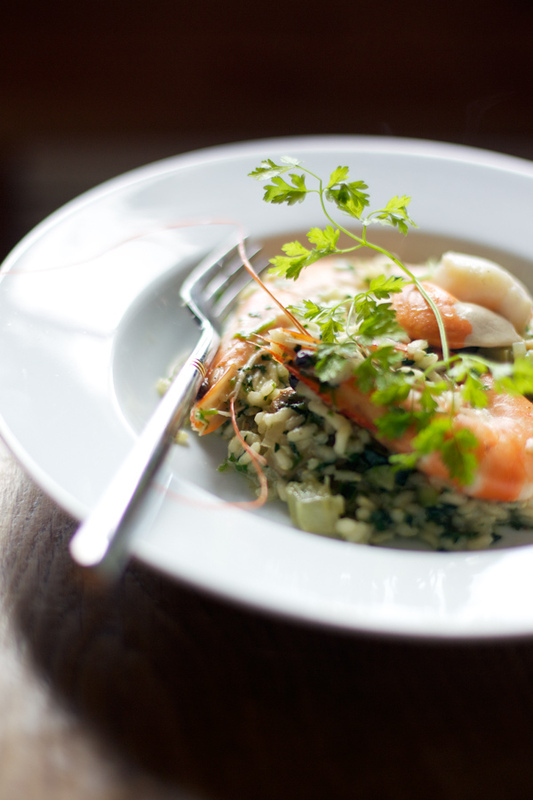 What a beautiful seafood risotto you have created, Béa! Excepcional el plato y preciosas fotos como siempre! 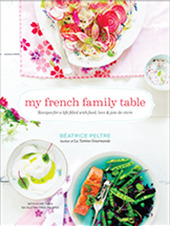 Lovely dish…..and I’m truly looking forward to your cookbook! Your mushroom risotto taught me how to make risotto, and now I make it all the time. This looks great. I love all the little details in your recipes, and how they make the end result so perfectly delicious. Cela fait plus d’un an que je vous lis régulièrement et que je suis totalement inspirée…à telle point que j’ai (timidement) commencé mon propre blog culinaire il y a quelques semaines: Bien dans mon assiette (www.bdmassiette.canalblog.com). Si vous avez une minute vous pourrez me dire ce que vous en pensez. J’ai en tout cas référencer votre blog sur le mien et attends avec impatience votre livre. Langoustines et noix de Saint Jacques… tout cela a l’air tout simplement délicieux ! Et remets toi vite pour nous revenir en pleine forme ! The lighting in the last photo is absolutely stunning. I love how your risotto is a backdrop. The perfect foil for beautiful seafood! ca a l’air vraiment delicieux, par contre ce que je vois sur la photo, ce n’est pas de la langoustine mais de la crevette rose ! First time here, loving it delicious risotto and my my gorgeous picture! Hum, c’est vrai que tu fais du risotto toutes les semaines? J’adore l’alliance avec les coquilles St Jacques, quel raffinement! Et j’aime cette notion de “comfy food”. Bon rétablissement. Shiny pictures… I would like to have a look at that “beautiful” kitchen… hope you share some pictures with us when it’s ready. 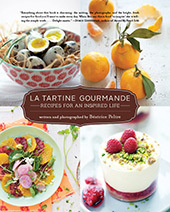 Comme d’habitude, tes photos, textes et recettes sont absolument “outstanding”. Je suis moi aussi expat francaise devenue photographe aux US (j’habite a San Francisco) et passionnee de cuisine. Felicitations, bon courage en attendant ta nouvelle cuisine et a bientot. 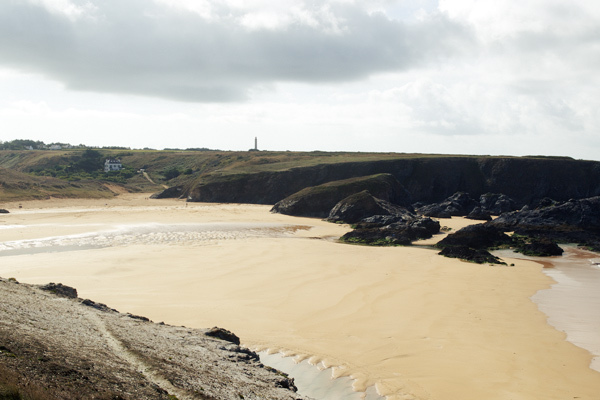 tres belles photos de Belle ile, cela me donne envie de retourner….aurais-tu une bonne recette de galette? J’ai vu tes photos de galette, j’ai commence a saliver! difficile d’etre une Bretonne expatriee…. Béa, je suis curieuse de savoir ce que tu cuisines à ta fille, ce qu’elle aime, ce qu’elle mange avec envie. Ma fille Lila qui va bientôt avoir 18 mois commence à affirmer ses gouts et refuse souvent les plats que je lui prépare à base de légumes. Lulu adore tous les plats à base de riz. Donc je fais souvent des risottos, ou des plats complets avec riz et légumes cuits, par exemple, dans du bouillon et du lait de coco. Elle aime aussi le poisson, le poulet, le lapin même, donc je fais de cela aussi. Des galettes de légumes râpés aussi, car c’est facile à manger. Et puis des soupes. Corn and salmon chowder, légumes, ou lentilles corail. Et quand je fais des pâtes, par exemple, au lieu de faire des carbonara traditionnelles, je râpe une courgette et j’assaisonne de cumin. Elle adore cela. Aussi une sauce au cresson pour aromatiser le riz ou les pâtes. Voilà quelques idées. J’espère que cela va t’aider. A bientôt.